The PB post base provides a connection between a post (or column) for decks, patio covers and other top-supported structures. Available with standard or ZMAX® galvanization, which offers extra corrosion resistance for outdoor or treated-wood applications. Galvanized. Some products available in ZMAX or HDG coating. See Corrosion Information. Install either nails or bolts. Holes are provided for installation with either 0.162" x 3 1/2" nails or 1/2" bolts for PB66 and PB66R; all other models use 0.162" x 3 1/2" nails only. A 2" minimum sidecover is required to obtain the full load. Concrete shall have a minimum compressive strength, f'c = 2500 psi. 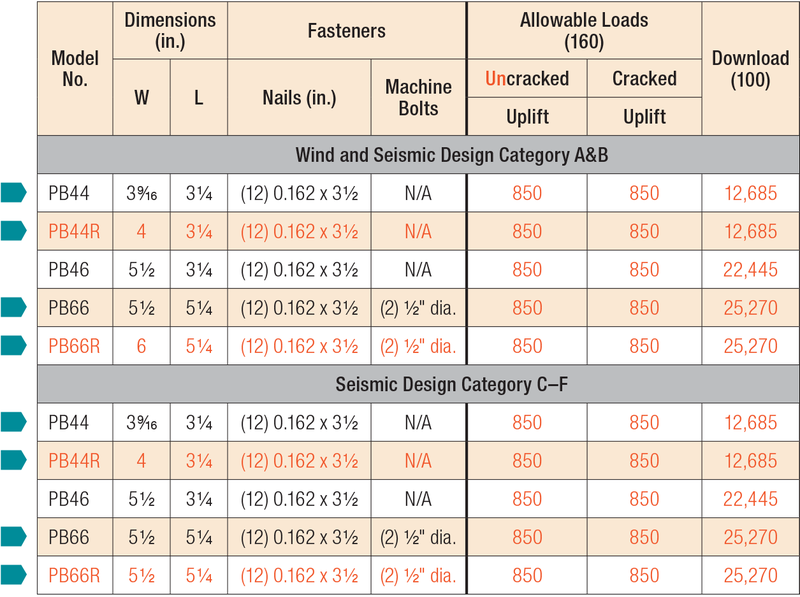 Multiply Seismic and Wind ASD load values by 1.4 or 1.67 respectively to obtain LRFD capacities. In accordance with IBC Section 1613.1, detached one- and two-family dwellings in Seismic Design Category (SDC) may use “Wind and SDC A&B” allowable loads. For lateral loads for all PB models: F1 allowable = 765 lbs. F2 allowable = 1325 lbs. PB See specific model numbers for code listings. PB44Z No evaluation report listing. PB46R No evaluation report listing. PB66Z No evaluation report listing.